This very, attractive, beige-brick, 14-story building is a cooperative with 50 apartments. 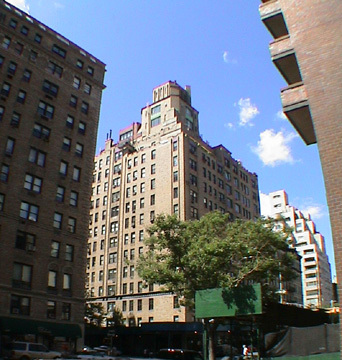 The Art Deco-style, pre-war building has a prime Carnegie Hill neighborhood location that is close to several private schools and important cultural institutions and has convenient local shopping and restaurants. It is diagonally across Madison Avenue from the very tall luxury apartment tower at 45 East 89th Street. The building's top has surprising splashes of color, that are quite welcome and its top is asymmetrically terraced. The building has nice architectural detailing, a two-step-up, canopied entrance, a doorman, consistent fenestration, nice retail, sidewalk landscaping and protruding air-conditioners. It has no garage, no balconies and no health club. There is good cross-town bus service on 86th Street and a subway station at 86th Street and Lexington Avenue. Central Park is a block-and-a-half away.